We were sat in the HQ waiting for the numbers to arrive, when a voice from across the room pipes up “It’s snowing outside”. Sure enough, the clouds had darkened and sleet and snow were falling. Thankfully, this didn’t last too long but it meant the roads were damp and slippy for the start of the race. Myself, John M, Paul and Graham had made the trip to Aughton and were all looking forward to a good race. After the obligatory briefing (8 laps, a few sections of double white lines, and not many potholes) we assembled behind the lead care and in next to no time we were off…. No neutralised section, just straight down to business. 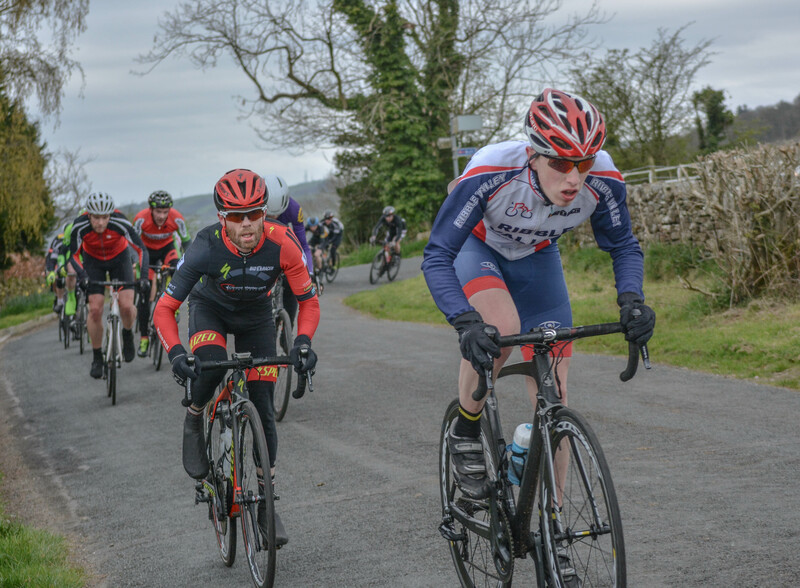 Having not ridden the circuit before I was keen to get a lap or two under my belt to get the feel for the circuit, so I positioned myself in the middle of the bunch and got carried along for the first lap. After passing the HQ at the start of lap 2 we took the first 90 degree left hander and a number of riders went down on the greasy corner. I slammed on and ground to a halt, thankfully keeping upright. A mild panic ensued as those riders caught on the wrong side of the crash hurriedly pressed hard on the pedals to try and get back on to the bunch as it strung out down the quick downhill section. Eventually I made it back but was feeling the effort…. Definitely burnt a match there. There were numerous attacks off the front of the pack but nothing went more than about 10 seconds up the road as the lead car was always in sight. Then on lap 3 David Gomez Cazorla attacked off the front and built up a lead of perhaps 30 seconds on the chasing bunch. The remaining laps ticked by and each lap seemed to follow the same pattern. Fast throughout, easing up only occasionally but hard when the elevation went up on the backend of the circuit and up over the start finish. Various riders tried to get across to David but all attempts were chased down. This constant effort saw riders pinged out of the back, and by lap 5 the bunch was down to maybe 30-35 riders. It was at this point I was having thoughts of what my next move would be…. Would I make a move and try and get away myself, hopefully taking a couple of riders with me, or should I sit in and try my luck in the gallop seeing as it was an uphill finish which would suit me. As it happens, we crossed the finish line at the end of lap 5 and we heard the bell……. “Strange…. The race is 8 laps I thought”…….. As there was no lap board being used, this just added to the confusion…. 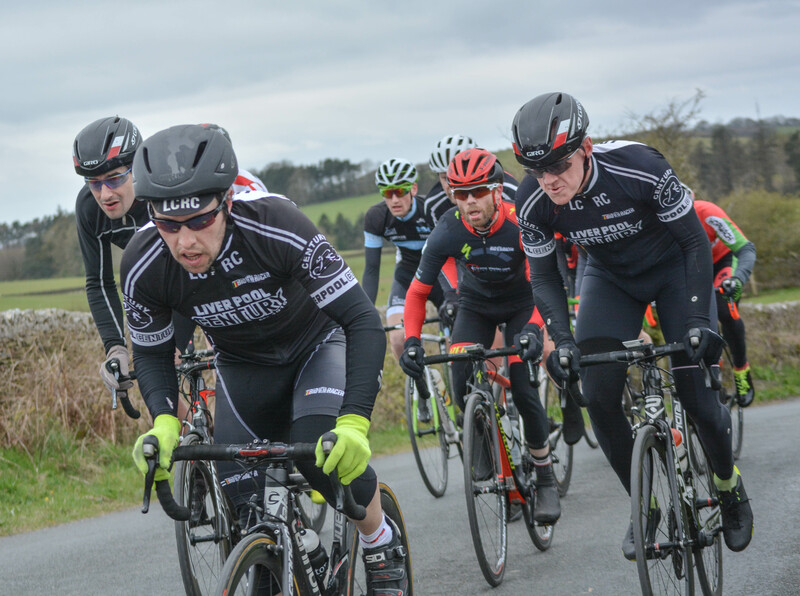 Other riders were also unsure whether we had 6 miles of racing left or 18 miles! It turned out the race had been cut short, so that last lap was the fastest of the race, the bunch was bearing down on David, and in that last 6 miles various short lived attacks came and went as the pace was kept high. The last turn on the circuit is a tight left hander before the kick up to the finish….. around 500m. Ninety percent of the riders were trying to get through that last corner in the first few riders so you can imagine it was a little bit sketchy but we all got around safely….. and then the gallop began. I’m no sprinter, so I’d tried to keep safe but that meant I was starting a little bit further back than I’d have liked. I passed quite a few riders before the line appeared and crossed it in about 15th position…. Not great…. But the race fitness is definitely coming. After arriving back at HQ I learned that Paul had pulled out with a knee injury, and Graham and John had finished the race in the second bunch on the road. 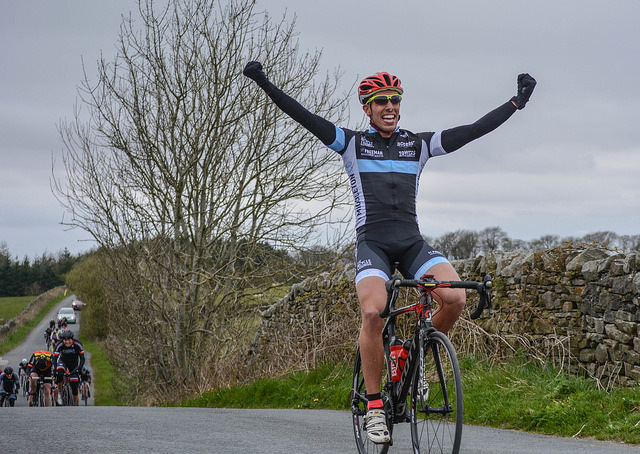 The race was won by David Gomez Cazorla, who was very strong on the day and who managed to keep a very fast bunch of riders at bay for 3 laps of the circuit…. Well done fella. This entry was posted in Results and Reports and tagged Aughton RR, David Gomez Cazorla, Graham Balshaw, John Bamford, John Myburgh, Paul Beech. Bookmark the permalink.